Both sexes fully winged. Body yellow without dark markings, but tergal antecostal ridges weakly shaded; antennal segment II paler than III, segments III–VIII grey; major setae light brown; fore wings shaded in basal half, clavus darkest. Head wider than long; ocellar triangle with widely spaced transverse striae, postocular region with closely spaced striae; 3 pairs of ocellar setae present, pair III close together behind fore ocellus. Antennae 8-segmented; III–IV with forked sensorium. 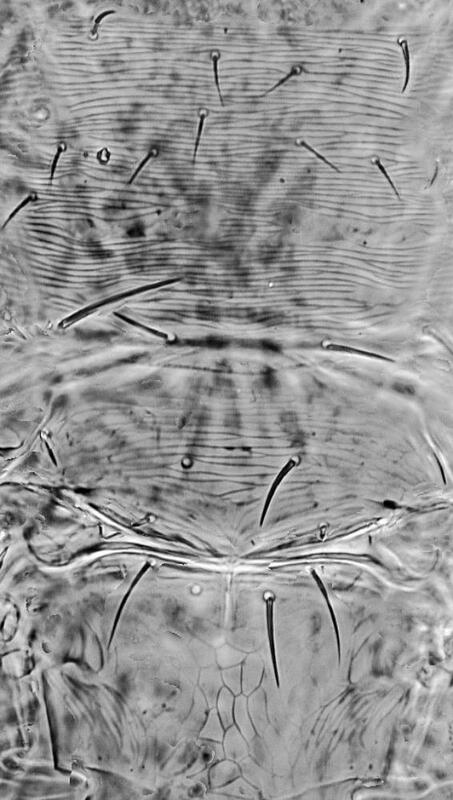 Pronotum with closely spaced sculpture lines; posterior margin with 4 pairs of setae, S2 prominent and about 35 microns long. Metanotum with irregular reticulation; median setae close to anterior margin; no campaniform sensilla. Fore wing first vein with 3 setae on distal half, second vein with 3 widely spaced setae; posteromarginal cilia wavy. Abdominal tergites III–VI median setae small, slightly wider apart than their length; II–VIII with lateral thirds covered in closely spaced rows of fine microtrichia, these microtrichial fields with 3–4 discal setae, posterior margin with fine comb; tergite VIII comb complete, discal microtrichia present medially; tergite IX with no discal microtrichia. 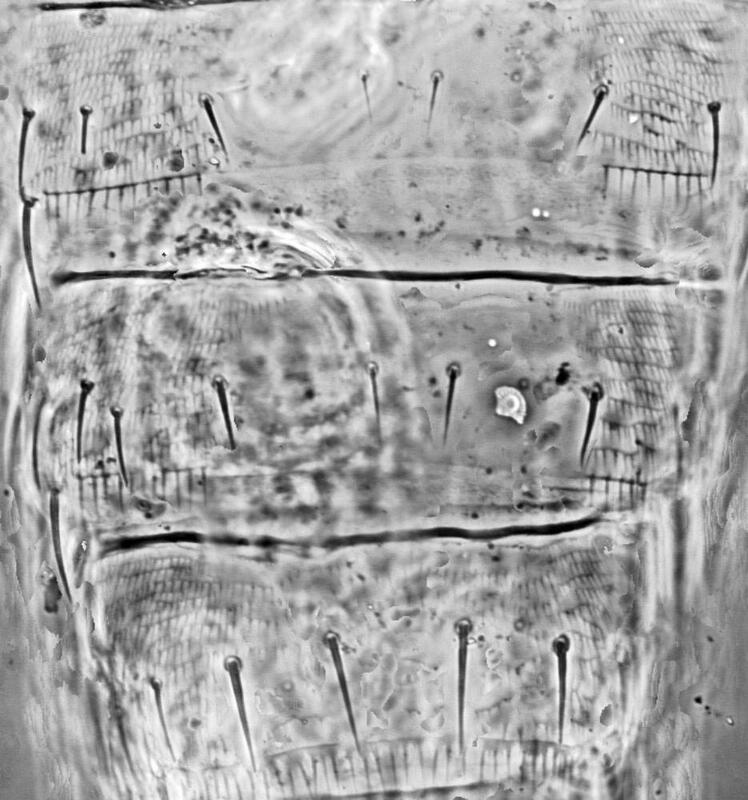 Sternites without discal setae; microtrichial rows only present laterally, not extending mesad of setae S2; posterior margins without comb of microtrichia. Male smaller than female; tergite IX without paired drepanae; hind femora without comb-like row of stout setae; sternites without pore plates. Six female and three male paratypes of S. solaris have been studied. None of these slide-mounted specimens are sufficiently well-prepared for satisfactory photomicrography, and the species cannot at present be distinguished satisfactorily from the common Californian citrus thrips, S. citri. 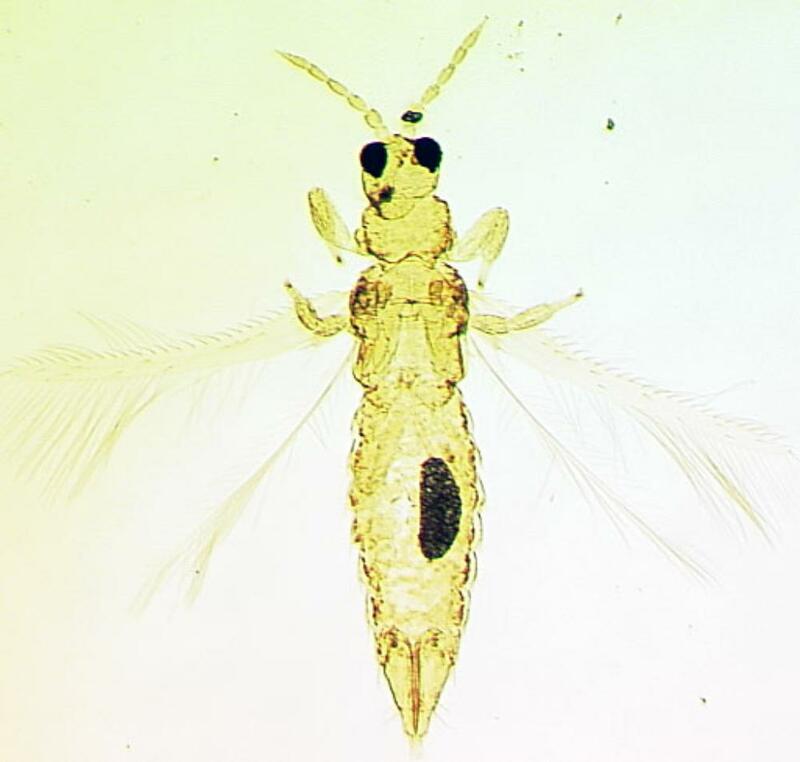 The genus Scirtothrips currently includes 100 listed species from various parts of the world. Bailey (1964) provided keys to 13 from North America, but that work was based on specimens that were not fully cleared, and thus few structural details were available concerning differences between species. The identity and validity of certain of the species from California, including S. solaris and S. tehachapi requires further study based on freshly mounted, fully cleared specimens. Similarly, Johansen & Mojica-Guzman (1999) provided keys to 33 species from Mexico, but doubts have been expressed concerning the biological reality of many of these (Mound & zur Strassen, 2001). Hoddle & Mound (2003) provided information on 21 Scirtothrips species from Australia, and Rugman-Jones et al. (2006) produced a molecular key to several pest species in this genus. Adults, including the holotype, were collected in considerable numbers from Libocedrus decurrens (Cupressaceae), but the paratypes included many specimens from different localities and several other plant species, including Prunus demissa (Rosaceae) and Prosopis juliflora (Fabaceae).